If you’re anything like me, you’re probably getting really excited about spring clothes about now. 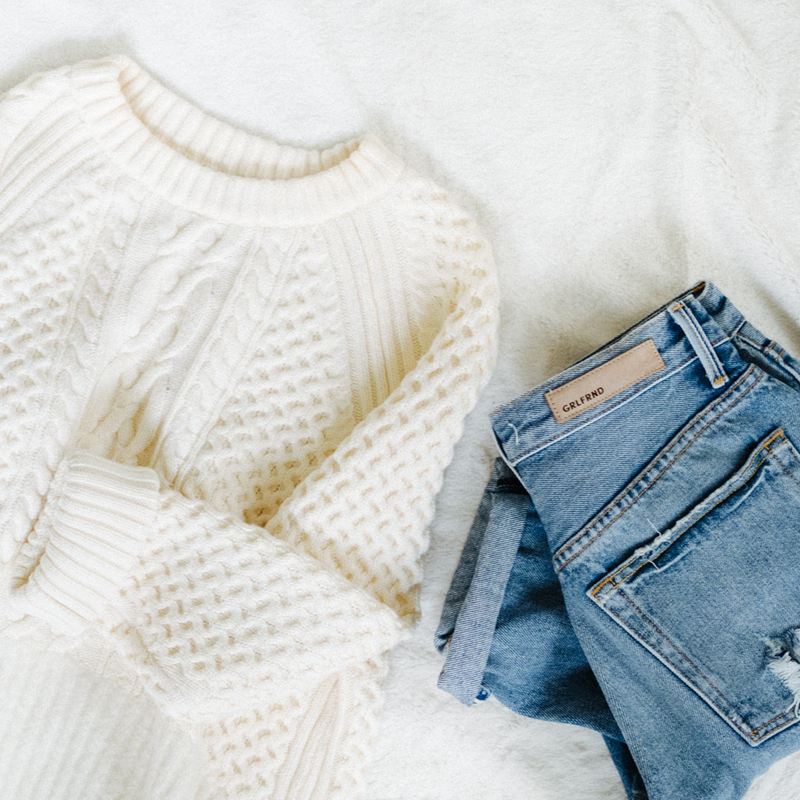 But before we pack away all our winter clothes and rush head first into spring, let’s take a moment to show our sweaters some appreciation by giving them a bit of proper care. 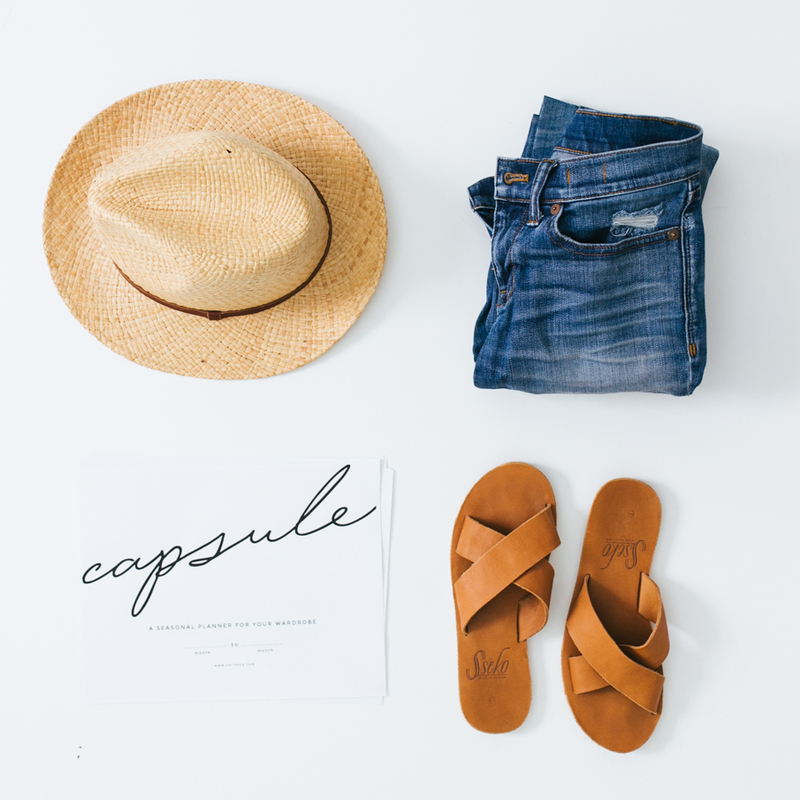 Taking good care of our clothes is one easy and inexpensive way we can be responsible consumers. 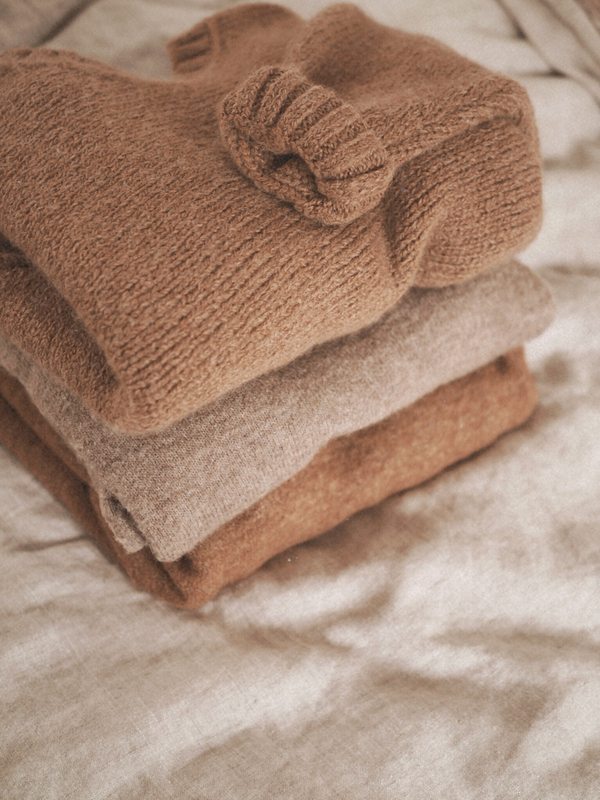 In this post, we’ll chat sweater care and proper storage. We’ll cover everything from pesky pills, to hand washing techniques, to how I store my sweaters. The good news is that there’s an inexpensive solution: A six dollar defuzzing comb. This little guy will easily eliminate your pills when they pop up. Battery operated fabric shavers exist too, but personally, I think the comb is easier to use. So, give your sweaters, knits, and coats a once-over with a defuzzing comb and they’ll be ready to go next fall. 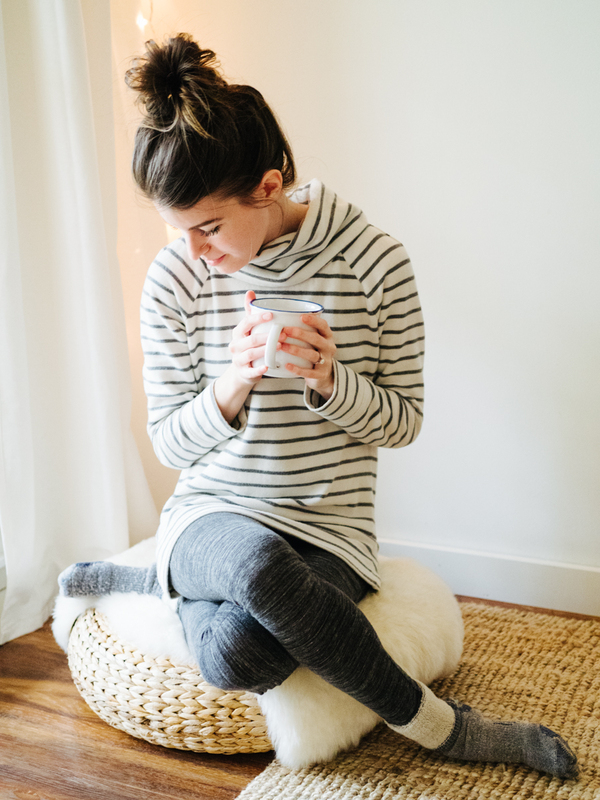 Tip: It can feel like a time-consuming task, so I like to break it up by defuzzing a few sweaters at night while my husband and I watch TV — I bring four or five sweaters to the couch with me, cozy up, and start defuzzing. 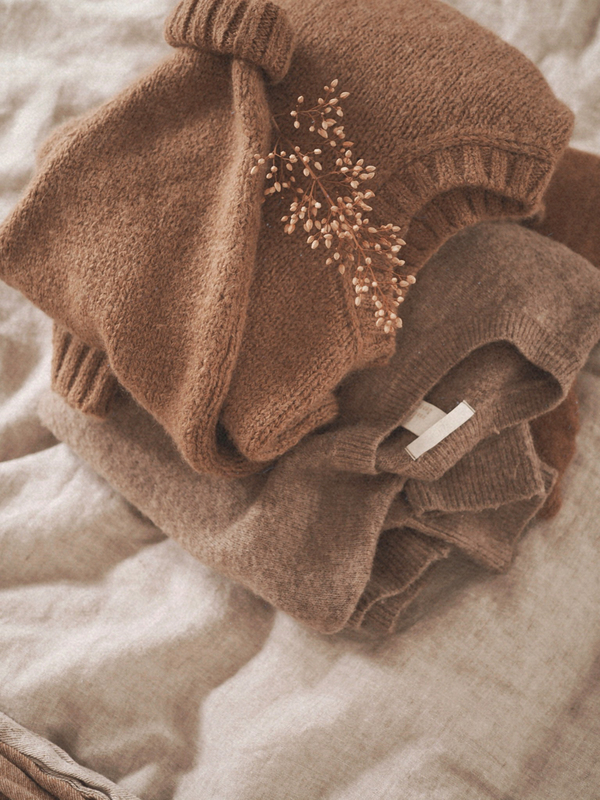 The best way to preserve sweaters is to simply clean them before storing. However, it’s all too easy to skip this step, especially if your knits don’t look dirty. 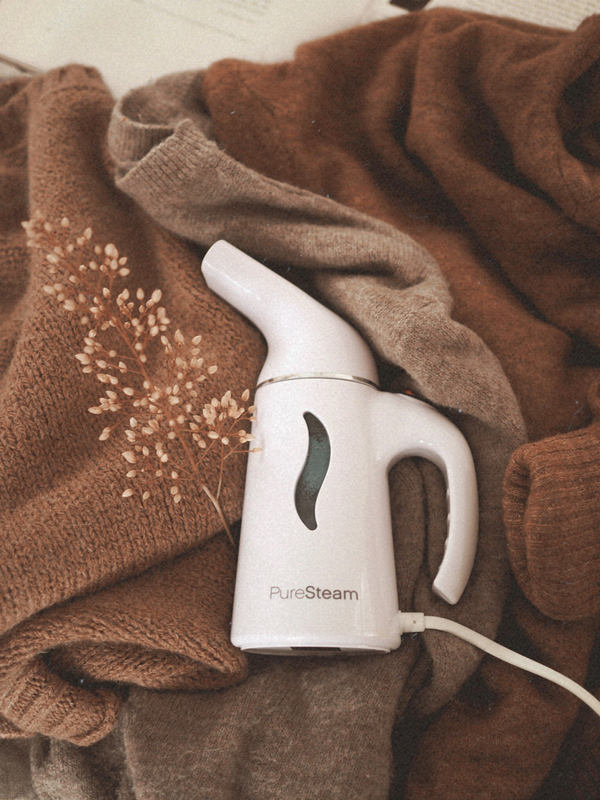 STEAMING: When you think of steaming clothes, the first thing that probably comes to mind is removing wrinkles. But! It does so much more. Steaming sanitizes clothes by actually killing any bacteria that might be lurking in the fibers. Because of that, it can even remove faint odors. I use a small travel steamer, like this one, but I’m thinking of upgrading soon to a larger steamer, like this one. It’s an excellent way to “wash” your clothes between washes. HAND WASH: If you want to hand wash, start with a clean sink (avoid using a bleach cleaner on the sink beforehand). Fill your sink up with water and add a mild detergent. I like this one for sweaters. Gently agitate any stains or smelly spots with your fingers, then let it soak for about 5 minutes. Rinse thoroughly, then roll it up in a towel to get extra moisture off — don’t wring it out. Finally, lay it flat to dry, gently reshaping if needed. GENTLE CYCLE: If hand washing isn’t something you want to do, try putting your sweater in a pillowcase or in a lingerie bag and running it through the washer on a gentle cycle with a mild detergent. Note: I rarely (if ever) do this because putting a dry clean only sweater in the washing machine is a big risk — it can shrink or possibly ruin the sweater. Make sure you research the fabric content of your sweater first and proceed with caution. Finally, take one last step against moths by spraying your sweaters with a sweater spray. I use this Wool + Cashmere spray by The Laundress. It removes odor and it’s got antibacterial properties. All of my sweaters get a light mist of this stuff when they come out for the season and when they go back into storage at the end of the season. It’s powerful, and a little goes a long way. I’ll say it again — proper storage starts with clean clothes. The cleaner the clothes, the less likely they are to attract moths and bugs that might ruin them. After I’ve defuzzed, cleaned, and sprayed my clothes, I fold everything and put them in a plastic set of drawers with my other off season clothes, making sure to give everything room and not pack it too tightly. The plastic drawers live in a spare closet in the house (so that it’s room temperature) and I keep the lid slightly open, so the clothes have a bit of airflow. You can see my off season storage in my Instagram Story Highlights. Finally, tuck in a couple of lavender sachets, and you’re finished! And there you have it! Four steps to ensure longevity for your winter clothes. 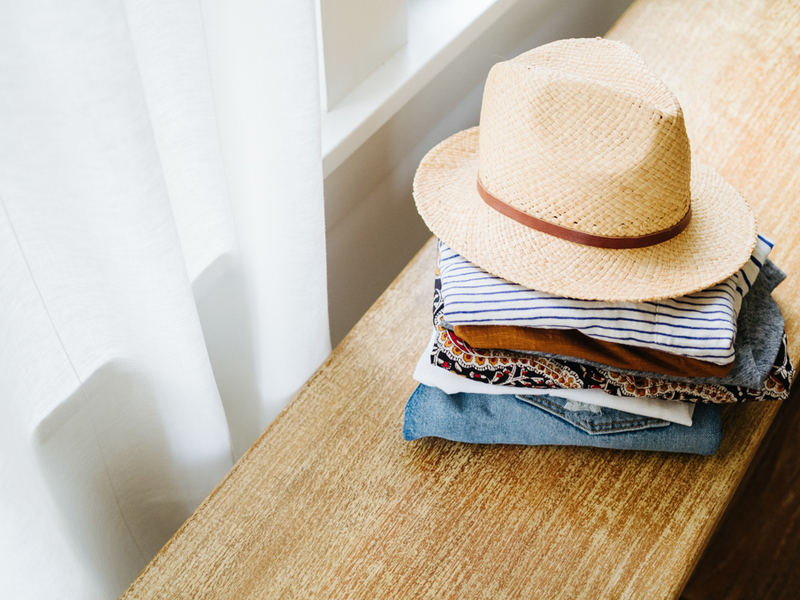 Now it’s your turn — how do you prepare your winter clothes for storage? What do you do to ensure the longevity of your winter clothes? Got any tips to add to this list? I’d love to hear ’em! Great tips! My favorite soap for sweaters is “Eucalan”. It’s a bit expensive but cheap compared to dry cleaning. It’s an herbal soap that doesn’t have to be rinsed, therefore saving a step. After soaking overnight, I gently squeeze out the water, carefully lay it out onto an old beach towel and roll up to soak up more water. Then I carefully lay it out to dry flat on another old beach towel, usually for a day. Then when the water weight is gone, I finish drying on a wooden drying rack. Eucalan has herbs that protect the wool from moths, but I always put in a lavender sachet for storage. They are fun and easy to sew. Ah! A soap that doesn’t have to be rinsed — I’m intrigued! :) Thank you for sharing your care process, Beth. So helpful! I love this! I’ve encountered moth infestations a couple of times (just finished dealing with the second one). I thought I was doing a good job caring for everything after the first infestation years ago, but clearly not enough. Remembering the microscopic crumbs or sweat that can attract moths is essential. I have a front loader washer with a “steam fresh” option, and I just recently used it to freshen up some dry clean only items, as well as some wool and cashmere. It worked great. I will be using it between proper cleanings to eliminate the crumbs and sweat. I want to second the products you recommend. I prefer the sweater comb to the electric defuzzer, too. I also love The Laundress’ Wool and Cashmere products. I have both, too! On The Laundress’ website, they have a bunch of tutorials on how to wash clothes that you think you can only dry clean. I use the “wool/hand wash” cycle for all my sweaters and some other items marked dry clean only. But I agree, you need to feel okay if it doesn’t turn out the way you expect. It is a time consuming process because of the time spent on pressing or steaming out wrinkles after drying flat or hang drying. For many, the dry cleaner, while pricey, may be worth it. Thanks for a great (and timely) post! A little tip if you do shrink a wool sweater in the washer, or even the dryer: re-wet the sweater in a bowl of luke warm water in the sink, then massage in a good big handful of hair conditioner – any type, just cheap stuff will be fine, and leave the sweater to soak in the sink of conditioner-y water for about half an hour. Then drain the sink and squeeze most of the water out – but don’t rinse out the conditioner. Lie a large towel down on the floor and gently stretch the sweater back to its original size. You can roll the sweater in a towel to absorb the water, but don’t wring it out. Try and dry flat – or if that’s not possible, hang up on a hanger somewhere – or I’ve even put the sweater on a radiator….though I don’t think you’re supposed to do that. I shrunk a pure wool sweater belonging to my husband 3 times in quick succession – just kept accidentally bunging it in with the rest of the family laundry, oops – and this trick worked every time. I bought that spray on your recommendation and I love it! It’s brilliant for spritzing the armpits of sweaters to stretch out the time between washes. 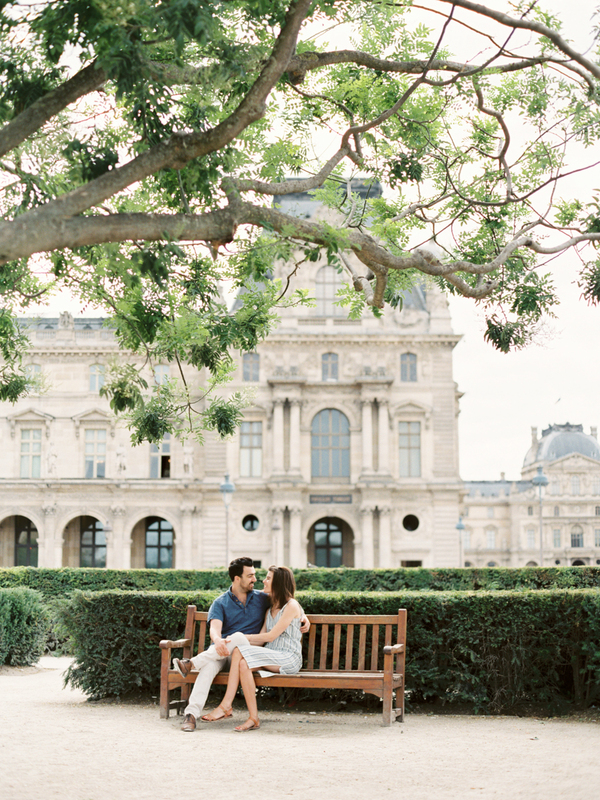 Very helpful tips–thank you!! I don’t own a steamer, but I’m wondering if I could get the same sanitizing effect by putting clothes in the freezer?! I’ve heard of people doing this with their jeans, so why not sweaters? I’m sure this isn’t as effective as actually washing them, but perhaps it could help remove mild odors between washes, like with a steamer. Would love to hear your thoughts on this! Hi Laura! I’m no expert, but I’ve read that freezing is really most effective when something is flash frozen, rather than popped into the freezer for a few days. But then again, it could be worth a try! Anyone else want to chime in? I have to disagree about the canvas bags, since insects like it better there and there is a high change they will ruin your sweaters and the bag (it happened to me!) , trust me, plastic or even some water-proof fabric might be better, so don’t change your plastic ones just yet. Thank you for sharing, Caroline – I’m inspired to work on my pills (ugh). Where is that beautiful speghetti strap top from? Hi! Thanks for the great advice. Wondering if you can successfully hand wash wool. Hi Jazz! I have in the past and it’s worked out, but I’d proceed with caution all the same — anyone else want to chime in? I always hand wash my wool sweaters or use the wool cycle on my front loader machine with the sweater inside out in a mesh bag. Most wool sweaters I have actually say to hand wash them. Use a detergent designed for wool. You want minimal agitation and don’t twist, gently squeeze out the water. Rolling the sweater in a towel after washing helps remove more water before drying. The important part is to reshape and dry flat, rather than drying in a dryer. Martha Stewart has videos on how to do this. I use something called Silk and Wool laundry liquid from the Co-operative. I don’t think you guys would have that in America (I’m in England) but I’m sure you could find an equivalent. I put a capful of that in the washing machine and then put it on a wool wash. When that’s finished, I put it on spin to get rid of the excess water and then lay the clothes flat across a clothes airer, to dry naturally. It’s all been fine for my clothes so far. The spray from The Laundress is really, truly amazing! I always wear a tee underneath my sweaters as a preventative measure – it helps prevent transfer of oils from my skin and deodorant residue to the sweater. I can’t “pack away” my winter clothes because I never know when we’ll travel to a cold destination, so for now my sweaters live among the rest of my closet in the grey sweater bins from The Container Store (which I really like, by the way, for whenever you may swap out your sweater storage). Just a tip to add. I am gonna check out that detergent that doesn’t need rinsed out and see if it works for me, but as a mom of two small kids I just don’t have time to hand wash! I have an energy efficient top loader with no agitator, so I throw them in on delicate and choose “no spin,” and it has worked out for everything even my wool/dry clean only sweaters! (I do place them in delicate bags just to be safe.) The drum moves gently back and forth and then the water just drains out the bottom. Then I roll them in a towel just as I would when hand washing. A lot of washers have this design now so this might work well for others who have similar machines to mine. Hi Caroline! I’m sorry if you’ve already addressed this somewhere, but I was wondering where these sweaters are from? They are gorgeous! Unrelated sorry, but I have to express my fascination with the evolution of your colour palette over the years! From early Un-Fancy days that featured a lot of denim, cream, blues and blacks (lots of cool tones) all the way up to your current sepia toned 70s style with warm browns, beige, mustard etc. It’s been super interesting to follow your style! Have you just felt a pull towards this spectrum? Is it a more ‘slow’ colour to you? I’ve had such terrible problems with “moths” (technically the larva of carpet beetles, I think) in my merino and cashmere that now I store all those types of items in large ziplock plastic bags. I have tried cedar, lavender, cloth bags, even plastic boxes, but the little bugs always managed to find my best items. I wash each piece by hand, let it air dry, and then carefully seal each one in a large (2 gallon? I can’t remember) ziplock bag. I don’t press all the air out, so it also helps prevent the sweaters from getting creased in the cedar chest. I’ve heard not to store your good cashmere in plastic bags, but I decided whatever the plastic did to it couldn’t be worse than being eaten by bugs. As a matter of fact, I haven’t seen any negative effects. Maybe because they’re only being stored for about 6 months, as opposed to several years? I don’t know. The large bags are quite heavy, and I reuse them over and over. Oh, and I used a cheap razor for de-pilling my sweaters. The really cheap disposable kind without moisturizing strips. I do it once a year, after I hand-wash and before I store. Have to be careful, of course, but it works very well and goes fairly quickly. I like that it cuts the pill off rather than pulling at it. I looked at the ingredients for the wool spray and it’s DI water, alcohol and essential oils… which is exactly what I put in a DIY pillow spray I make to keep my unwashable foam pillows fresh. I use tea tree oil for its antibacterial properties (it’s legit, I used to teach undergraduate labs and we used tea tree oil in bacteria and fungus growth experiments) and also lavender for the scent, but any scent would work on top of the tea tree oil fragrance. I’ve only ever hand-washed my wool sweaters, to great success ( I use COLD water though, ignore the advice to use even lukewarm.). With hand-washing, more time soaking is your friend to lift dirt and grime. However, you don’t want to over soak wool fibers. I usually soak in The Laundress detergent for 20 minutes, scrunch out the water (don’t wring! ), soak in clean water for a couple minutes to rinse, scrunch out water, soak in water a second time for 5 minutes, then scrunch out water. I set timers so I don’t forget, and go about my business in the mean time. Roll in towel and press to express water (I honestly walk on the rolled up towel to really get the water out! ), then lay flat to dry. What I love about wool is that I only have to do this process every couple of months, even though I bike to work regularly. Whereas with heavy cotton sweaters, they soak up sweat and smell immediately and I have to wash weekly, then they take forever to air dry. For more architectural styles where you don’t want the ribbing to shrink at all (which doesn’t bother me on “classic” style sweaters, b/c it’s not noticeable when wearing), THEN I might consider dry-cleaning. But honestly I find washing at home more convenient. As a bonus, it’s also cheaper and more eco-friendly. Hey Caroline! Huge, long time fan of your site. I am adamant about keeping my clothes in good condition and use a washing machine as little as possible and I thought you might be interested in this new product I just found called Day2. It’s almost like dry shampoo but for your clothes. I heard about it through the Edison Awards where it was named as a finalist. Just something new, packable, and interesting to try! Thanks for all of your great posts! I bought 3 new cashmere sweaters this year and am not going to chance it – going to pay the small fee for them to be stored for the season at my dry cleaner. 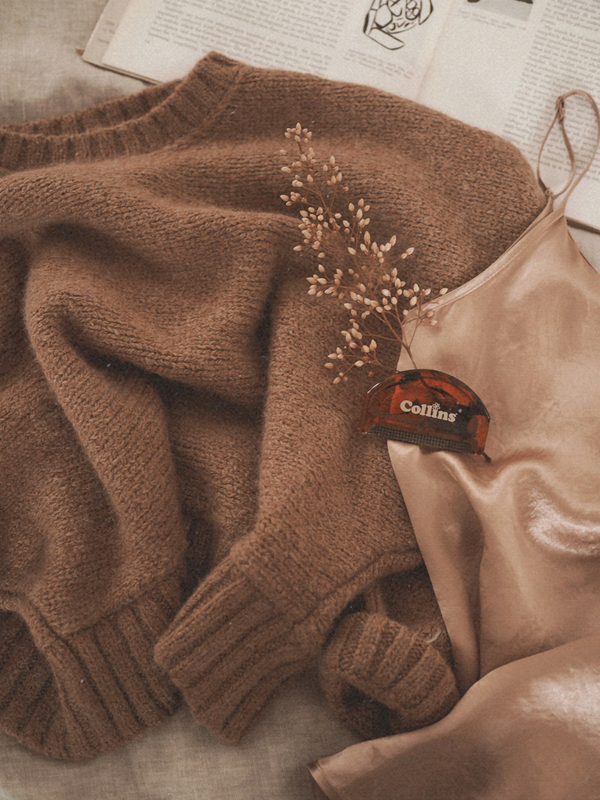 I had an old H&M sweater in my toss pile this year – I had it for a few seasons and it just looked grubby, but it was a shape/style that I really loved. I didn’t think the dry cleaner would do anything for an acrylic sweater, but they cleaned it up really nice and it looked brand new. That was a lesson in preserving fast fashion pieces. I do hand wash during the season, but am learning that outsourcing to the dry cleaner has been easier to keep everything looking good. New logo? I really do love all the negative space on your site. Great tips. I was prepping for storage and wondered if I should comb then hand wash? Or hand wash then comb? Am I overthinking this?